Consumers are increasingly choosing convenience and health. They are more aware of healthy food, and the number of eating moments is increasing, which results in smaller meals or healthy snacks being chosen more often. Due to their healthy aspects and sweet flavour, blueberries fit this development. The Greenery and Naturelle respond to this trend and introduce a break-away packaging for blueberries. 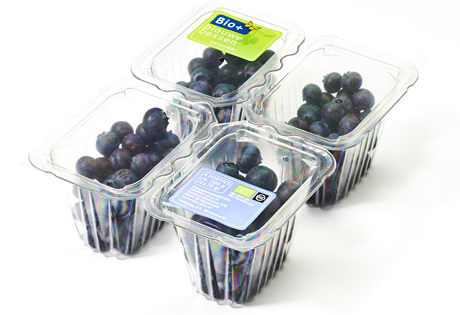 The break-away packaging for blueberries consists of four punnets with a top seal that can easily be broken apart from each other. The berries are packed per 75-gramme portion, and the packaging contains 300 grammes in total. Because of the top seal, the product is well-protected and the packaging has no chance of opening on its own. This results in a packaging that is easy to take with you to your job, the beach, festivals, in trains or after working out. The packaging is also suitable to give to children to bring to school. From left to right: Jurgen van ’t Hoff (Naturelle), Joyce Baak (PLUS Retail) and Bas de Graaf (The Greenery). The break-away packaging is available from PLUS Supermarkets under the Bio+ label as of now.